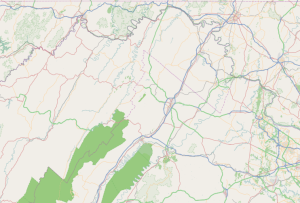 Jefferson County is located in the Shenandoah Valley and is the easternmost county of the U.S. state of West Virginia. As of the 2010 census the population was 53,498. Its county seat is Charles Town. The county was founded in 1801. Jefferson County is part of the Washington-Arlington-Alexandria, DC-VA-MD-WV Metropolitan Statistical Area. Jefferson County was formed from Berkeley County in 1801 because the citizens of southeastern Berkeley county felt they had to travel too far to the county seat of Martinsburg. Charles Washington, the founder of Charles Town and brother to George Washington petitioned for a new county to be formed. It was named for Thomas Jefferson, author of the Declaration of Independence and third President of the United States. Virginia previously had a Jefferson County, which is now part of Kentucky. Accordingly, in the State records of Virginia, there are listings for Jefferson County from 1780-1792 and Jefferson County from 1801-1863, neither of which is still in Virginia. The county was a frequent site of conflict during the civil war, as Union and Confederate lines moved back and forth along the Shenandoah Valley. Some towns in the county changed hands between the Union and Confederacy over a dozen times, including Charles Town, and especially Harpers Ferry. The Jefferson County Courthouse is the only courthouse in America to have held two treason trials: the trial of John Brown in 1859 and a trial arising from the Battle of Blair Mountain labor rebellion. Tripoint of Virginia, West Virginia, and Maryland in Potomac River east of Harper's Ferry and the lowest point in West Virginia. Both Berkeley and Jefferson counties had voted for secession in the vote taken on May 23, 1861. However, these counties lying on the Potomac River in the Shenandoah Valley, with the consent of the Reorganized Government of Virginia voted in favor of annexation to West Virginia in 1863 in a dubious election supervised by the occupying Union Army. Virginia tried to nullify this after the American Civil War, but the counties remained part of West Virginia. The question of the constitutionality of the formation of the new state was brought before the Supreme Court of the United States in the following manner: Berkeley and Jefferson County, West Virginia, counties lying on the Potomac east of the mountains, in 1863, with the consent of the Reorganized Government of Virginia, had supposedly voted in favor of annexation to West Virginia. However, many voters were absent in the Confederate Army when the vote was taken and they refused to accept the transfer upon their return. The Virginia General Assembly repealed the Act of Secession and in 1866 brought suit against West Virginia, asking the Supreme Court to declare the counties still part of Virginia. Congress, on March 10, 1866, passed a joint resolution recognizing the transfer. In 1871, the U.S. Supreme Court decided Virginia v. West Virginia, upholding the "secession" of West Virginia, including Berkeley and Jefferson counties, from Virginia. In 2011, West Virginia state delegate Larry Kump sponsored legislation to allow Morgan, Berkeley, and Jefferson counties to rejoin Virginia by popular vote. In October 1896, Jefferson County became the first county in the United States to begin Rural Free Delivery service in the towns of Halltown and Uvilla. According to the U.S. Census Bureau, the county has a total area of 212 square miles (550 km2), of which 210 square miles (540 km2) is land and 2.0 square miles (5.2 km2) (1.0%) is water. It is the only West Virginia county where the Blue Ridge Mountains and Shenandoah River can be found as referenced in West Virginia's state song, "Take Me Home, Country Roads" by John Denver. The lowest point in the state of West Virginia is located on the Potomac River (just east of Harpers Ferry) in Jefferson County, where it flows out of West Virginia and into Maryland. As of the census of 2000, there were 42,190 people, 16,165 households, and 11,315 families residing in the county. The population density was 201 people per square mile (78/km2). There were 17,623 housing units at an average density of 84 per square mile (32/km2). The racial makeup of the county was 91.02% White, 6.09% Black or African American, 0.60% Asian, 0.28% Native American, 0.04% Pacific Islander, 0.60% from other races, and 1.37% from two or more races. 1.74% of the population were Hispanics or Latinos of any race. In the county, the population was spread out with 23.90% under the age of 18, 10.00% from 18 to 24, 29.90% from 25 to 44, 25.10% from 45 to 64, and 11.20% who were 65 years of age or older. The median age was 37 years. For every 100 females, there were 97.90 males. For every 100 females age 18 and over, there were 95.40 males. As of the 2010 United States Census, there were 53,498 people, 19,931 households, and 13,971 families residing in the county. The population density was 255.2 inhabitants per square mile (98.5/km2). There were 22,037 housing units at an average density of 105.1 per square mile (40.6/km2). The racial makeup of the county was 87.6% white, 6.6% black or African American, 1.2% Asian, 0.2% American Indian, 0.1% Pacific islander, 1.8% from other races, and 2.6% from two or more races. Those of Hispanic or Latino origin made up 4.7% of the population. In terms of ancestry, 25.9% were German, 17.3% were English, 12.1% were Irish, and 6.6% were American. Of the 19,931 households, 34.6% had children under the age of 18 living with them, 54.9% were married couples living together, 10.1% had a female householder with no husband present, 29.9% were non-families, and 22.7% of all households were made up of individuals. The average household size was 2.61 and the average family size was 3.07. The median age was 38.9 years. The median income for a household in the county was $65,603 and the median income for a family was $77,185. Males had a median income of $54,959 versus $36,782 for females. The per capita income for the county was $29,733. About 4.4% of families and 8.4% of the population were below the poverty line, including 10.9% of those under age 18 and 6.9% of those age 65 or over. Jefferson County has been a Republican-leaning county in the 21st century. However, since 2008, it has rivaled Monongalia County (home to West Virginia University) as the most Democratic part of the state, likely due to its status as an exurban county of Washington, DC. For much of the 20th century, the county trended strongly Democratic due to historical sympathies for Confederate Virginia. 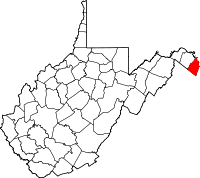 In contrast to its rock-ribbed Unionist and Republican Eastern Panhandle sister Morgan County, Jefferson did not vote Republican until Dwight D. Eisenhower won by twenty-seven votes in 1956, and afterwards voted Republican only in the 1972 and 1984 landslides, and in 1988. ^ "State & County QuickFacts". United States Census Bureau. Archived from the original on July 12, 2011. Retrieved January 10, 2014. ^ Ted McGee (March 7, 1973). "National Register of Historic Places Nomination: Jefferson County Courthouse" (pdf). National Park Service. Archived (PDF) from the original on June 4, 2011. ^ Vincent, Jenni (January 25, 2011). "Secession bill planned to 'stir pot'". The Journal. Archived from the original on February 11, 2015. Retrieved July 27, 2013. ^ "First Rural Routes by State". United States Postal Service. Archived from the original on 2013-12-28. Retrieved 2013-12-28. ^ "2010 Census Gazetteer Files". United States Census Bureau. August 22, 2012. Archived from the original on September 4, 2015. Retrieved July 24, 2015. ^ "Historical Census Browser". University of Virginia Library. Archived from the original on August 16, 2012. Retrieved January 10, 2014. ^ "Population of Counties by Decennial Census: 1900 to 1990". United States Census Bureau. Archived from the original on June 3, 2013. Retrieved January 10, 2014. ^ "Census 2000 PHC-T-4. Ranking Tables for Counties: 1990 and 2000" (PDF). United States Census Bureau. Archived (PDF) from the original on December 18, 2014. Retrieved January 10, 2014. ^ Leip, David. "Dave Leip's Atlas of U.S. Presidential Elections". uselectionatlas.org. Archived from the original on 23 March 2018. Retrieved 23 March 2018. ^ "Landmarks Nomination Report: New Hopewell" (PDF). Jefferson County Historic Landmark Commission. Archived from the original (PDF) on October 11, 2011. Retrieved March 20, 2012. Coletti, Matthew, "'The Fate Which Takes Us:' Benjamin F. Beall and Jefferson County, (West) Virginia in the Civil War Era" (U. Of Massachusetts MA Thesis 2014) online, major local newspaper 1848-1870. Wikimedia Commons has media related to Jefferson County, West Virginia.